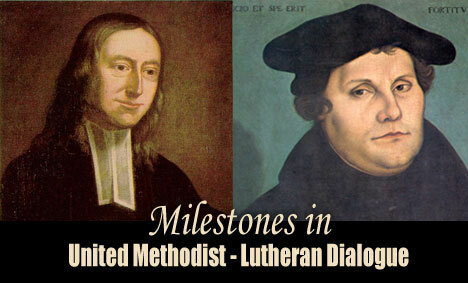 John Wesley (left) and Martin Luther founded the religious traditions that developed into The United Methodist Church and the Evangelical Lutheran Church in America. 1962-65—The Second Vatican Council, which promoted dialogue among Catholics and Protestants, opened several windows for ecumenical conversations. 1977-79—First round of formal dialogue between The United Methodist Church and Lutherans explores the sacrament of baptism. An official statement, “A Lutheran-United Methodist Statement on Baptism,” is published. 1979-85—Five-session conversation between the World Methodist Conference and Lutheran World Federation develops an official statement, “The Church: Community of Grace,” which covers such issues as the authority of Scripture, salvation, ministry and mission. 1987—Three of the four Lutheran churches involved in dialogue with The United Methodist Church -- the Lutheran Church in America, American Lutheran Church and Association of Evangelical Lutheran Churches – merge into the Evangelical Lutheran Church in America. The Lutheran Church-Missouri Synod remains independent. 1973-94—The Leuenberg Agreement, which started between Lutheran and Reformed churches in Europe, expands to include the British Methodist Church and most United Methodist churches in Europe. The agreement affirms mutual recognition of ministry and table fellowship. 2001-07—Third round of dialogue between The United Methodist Church and Evangelical Lutheran Church in America focuses on the understanding of Eucharist and paves the way for full communion. May 2005—The United Methodist Council of Bishops approves the Interim Eucharist Sharing agreement with the Lutherans and Episcopalians. August 2005—The Lutheran churchwide assembly, meeting in Orlando, overwhelmingly approves the interim agreement with The United Methodist Church. November 2005—A working draft of “Confessing Our Faith Together: A Statement toward Full Communion by the ELCA-UMC Bilateral Dialogue,” is made available to churches, seminaries and individual members for feedback. July 2006—World Methodist Conference signs on to a groundbreaking agreement between Lutherans and Roman Catholics on the doctrine of justification, an issue that helped create the split that formed the Protestant faith. April 2008—Delegates at the 2008 United Methodist General Conference in Fort Worth, Texas, approve the full communion agreement with the Evangelical Lutheran Church in America. Aug. 20, 2009—Evangelical Lutheran Church in America scheduled to vote on full communion pact at churchwide assembly in Minneapolis. *Bloom is a United Methodist News Service news writer based in New York.